Perkele´s Blog: Independence day coffee moment , itsenäisyyspäivän kahvihetki. Independence day coffee moment , itsenäisyyspäivän kahvihetki. Heres a quick shot from my latest trip,that ended up this morning with a cup of coffee made above fire. Today is our independence day and i honour,as always the older people who worked in homes and fought in trenches and woods to gain our freedom,to stop the russians from taking this beautiful land. I am in not,in any way, interested in political turns during war,my honour and gratitude goes totally to the men that made it all happen,especially during harsh winter time war,in frontlines,in the backs of enemy,in the supporting squads and field medical tasks,i salute every person who defended us, by doing something with their own hands...and also to the mothers and folks back in the home´s who had to raise the kids,feed the familymembers with what they had in hands,and it wasnt much. 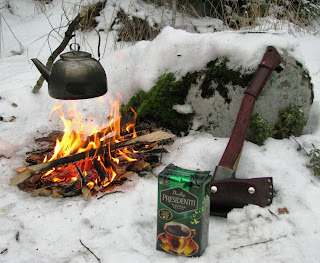 In modern Finland,thanks to war veterans and gone heroes,i can enjoy freedom to walk in to the woods,set up a fire and enjoy the silence,sounds of the campfire, let my hands warm in the glaze and carry my coffee pot and axe freely. During war,and long after that i bet average joe couldnt afford a premium coffee,like we do in todays free Finland. I got mine from Paulig, and i can tell you its fine tasting indeed,this dark roast. Even the pot i have,is traditional and back in the wardays there has been similar designs,that i know. Mine isnt old and beaten,its actually in its first use in that picture,and i thank OPA company for mine. Coffee pots like these fit needs more than well,and this one surely will last longer in camp-fire use,than any aluminium hiking model. Ill be writing more about this trip later,both in Finnish and in English. I very much respect the ordeals your people has gone through. I would like to know more about it, but I know that, different to many other countries, it actually were the people´s love, not the greed for power as in others, that defended your home country. I am not interested in the politics involved in war, either, it is always fat and rich people talking and lean, young people dying. I hope that Finland will stay free even in the bad times that are coming. For there is too little love and too much greed. Any way, thanks for sharing (again), and my deepest respect for the love you expressed. I think your country deserves it.